Wanted to share some experience on my new UM2+ after 560h of printing. I operate a few UM2s and after approximately 200h of printing I have to exchange the PTFE coupler with a fresh one (30% glass filled). Otherwise; Underextrusion. Apart from that, no major problems. Printing all sorts of materials but never mix on the same machine. For the new UM2+ underextrusion has occurred for the first time after 560h. 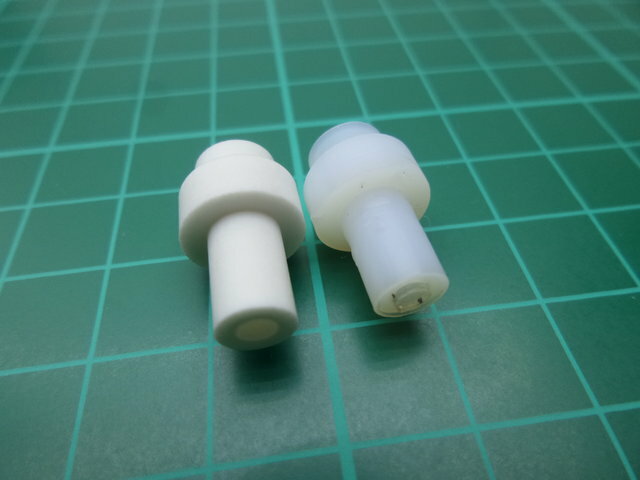 The new TFM PTFE bushing still looks OK so the cause mighty be found somewhere else. In any case I exchanged the bushing for a new one (not TFM though, still have to source the material). When taking apart the head I noticed that the cylinder which replaces the spring was not installed properly; it was misaligned due to a very tight fit. The TFM coupler had also been squeezed heavily against the nozzle, properly due to thermal expansion. But have to say; a very good performance improvement. I believe it is save to say that Ultimaker listens to people's feedback. Awesome. I use active cooling for the feeders on my old UM2s, so I will not be needing the upgrade kit. But I will upgrade to the new coupler in combination with the constant distance spacer.